A key factor in the quality of coffee is the balance of different attributes and characteristics. Colombian Coffee is characterized for being a beverage that has a clean taste, medium/high acidity and body, and a pronounced and complete aroma. These qualities can be obtained as long as the proper species and botanic varieties are grown in specific environments, characterized by high mountainous tropical regions with a specific type of soil and climate. In addition, several efforts are made in its cultivation, harvest and post harvest. The process of industrialization should ideally be performed immediately after the harvest. (For more information on this please see about coffee). Thus, the special quality characteristics begin with the selection of the adequate species. For this reason only 100% Arabica coffee is grown in Colombia, a species that produces milder coffees. Different varieties of these species that adapt to specific environments of the Colombian geography, or a combination of them, constitute the prime material of Colombian Coffee. The principal varietals of Arabica coffee that are grown in Colombia are: Tipica, Bourbon, Maragogipe, Tabi, Caturra, and Variedad Castillo®, previously referred to as Variedad Colombia. The selection of the specific varieties is the responsibility of Cenicafé, one of the most sophisticated centers of coffee research in the world. In order to illustrate that Colombia produces coffee in high mountains one should look at the coffee producing regions in the world. Because of their latitude, only in Eastern Africa (Kenya, Tanzania, and Ethiopia), and in Colombia do high quality coffee crops grow at altitudes of nearly 2,000 meters above sea level. The Colombian Coffee regions suited for producing high quality coffee consists of nearly 3.3 million hectares located at ideal altitudes and distributed within the mountainous regions of the country (see the descriptive map of the Colombian Coffee region). As can be observed, Colombian Coffee is cultivated along the three different mountain ranges of the Andes as well as in the Sierra Nevada of Santa Marta, which sprawl across the country from its Atlantic coast in the North to the border between Colombian and Ecuador in the South. Nonetheless, the land dedicated to the cultivation of coffee is confined to an area that oscillates between 850,000 and 900,000 hectares. Other areas in which coffee can be produced are dedicated to the maintenance of the natural forests and other agricultural activities. If you would like to know more about these regions and the persons that cultivate coffee in Colombia please visit the land of coffee. Other environmental factors associated with the temperature at which coffee grows are also crucial for obtaining a superior quality beverage. 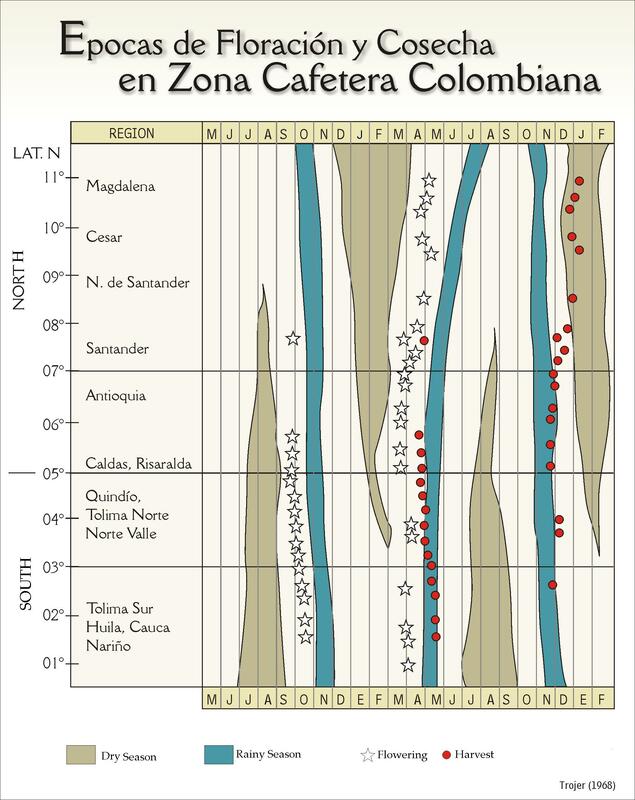 The proximity to the equator line (0 degrees latitude) generates a solar exposure that influences the median temperatures registered in the Colombian mountain chains. These specific conditions permit the existence of microclimates and favorable conditions for the cultivation of coffee at high altitudes. At these altitudes in the tropics, moderate temperatures are present year long, without extreme variations. The thermal regime, regulated in Colombia by the altitude associated with the mountains that rise to over 5,000 meters above sea level, allow the median temperatures where coffee is grown to vary between 18° to 24° C. Under these temperatures it is possible to cultivate coffee and avoid frosts. Consequently, in the Colombian Coffee Regions the temperatures remain within an optimal range for the cultivation of coffee, without experimenting excessive temperatures (extreme heat or frost) that would interfere the normal development of the Arabica coffee trees. The contrasts of the temperature during the day and the temperature throughout the year also favor the generation of sugars and other compounds within the coffee beans that develop, during the industrialization, appreciated attributes such as a medium/high acidity and a well balanced body. The soil where coffee is grown in Colombia varies from sandy to rocky and even clay like, in slopes that vary from flat to slightly undulated to steep and dramatic, with marked differences in the origin of the soil in relation to other coffee producing countries. 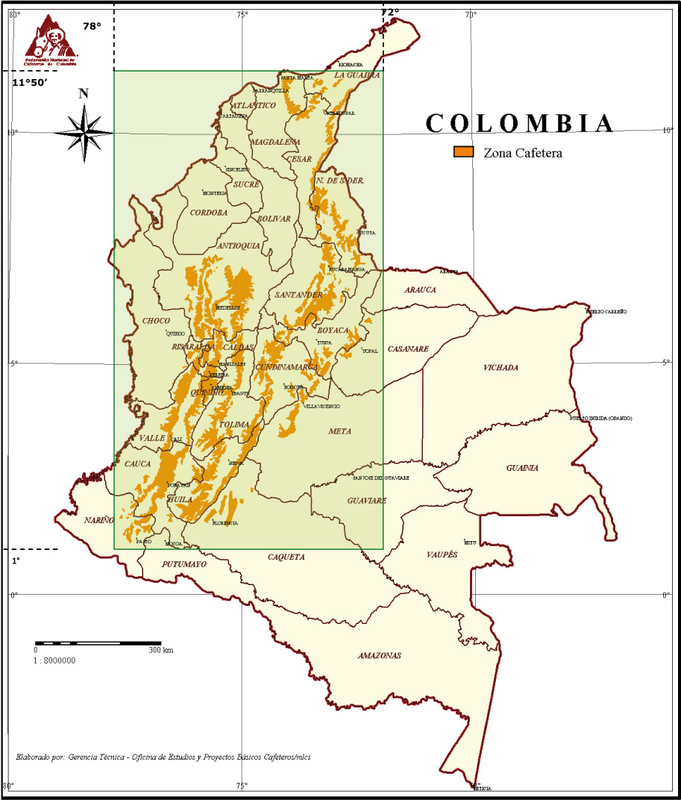 In Colombia there are different Coffee Regions throughout the three mountain ranges: Eastern, Central, and Western soils of igneous, metamorphic, sedimentary and volcanic origin are found. The main characteristic of the soils in the Colombian Coffee Regions is that most of these soils have volcanic origins, which have a rich content of organic material and good physical characteristics, reducing the need to apply fertilizer. The existence of these soils provide optimal conditions for the cultivation of coffee as their structure permit that organic material be slowly decomposed, making it possible for good aeration of the rooting system, and consequently an adequate supply of nutrients. It is noteworthy to comment that the common characteristics of the soils that favor the cultivation of coffee is that they have relatively low ph levels and are good retainers of humidity. Thanks to the fertility of the soil in the Colombian Coffee Region, in contrast with other coffee producing countries such as Brazil, the former do not require application of minor elements, such as zinc or boron in order to maintain its fertility. This high fertility is due to the high amount of organic content, which is a product of the volcanic origin of these soils. The rain regime is another important factor for the cultivation of coffee in Colombia. The geographical location of Colombia submits it to the influences of the Atlantic and Pacific oceans, the Amazon, the presence of inter-Andean valleys and the topography allows the presence of different tropical microclimates that offer particular conditions. They are mostly adequate for the cultivation of coffee, in regards to the amount of available water, the temperature, luminosity and wind regimes. A factor that distinguishes Colombia is the presence of the Intertropical Convergence Zone (ITCZ), where the atmospheres from the northern and southern hemispheres collide. The convergence of these winds over Colombia generates two significant rain seasons every year in the center of the country: April to May, and October to November. The convergence of these winds, also known as doldrums, combined with the varied topography permit an adequate distribution and amount of rain throughout the year, with enough water to complete all of the productive cycle of the crop. The general tendency in the Colombian Coffee Region is the presence of two intercalated dry and rainy seasons throughout the year, permitting the regular blossoming and harvest of fresh coffee. In summary, the climate of Colombia's coffee growing regions is not only characterized by a high amount of rainfall, thus avoiding the use of artificial hydration, but also consists of marked rainy seasons that generate specific harvest seasons and consequently the availability of fresh coffee throughout the year. The manual labor is another key element for the cultivation of coffee. Thanks to the presence of the Colombian Coffee Growers Federation, the country has developed a support system for the product that is backed by the development of a quality coffee culture. This culture is based on the collective action of over half a million coffee growing families that directly attend the coffee crops, selectively harvesting the beans and carefully and patiently performing the post harvest processes that would let them pass the diverse quality controls to which Colombian Coffee is exposed to, from the farm up to the global consumption centers. Clearly, the valued work of people involved in the cultivation, harvest and post harvesting of coffee are fundamental for obtaining a product of superior quality.